Bride Teddy Bear is from the Steiff Classic collection and made in beautiful White mohair. This wonderful Steiff Classic piece, wears the famous crystal Button in Ear with White ear tag. She wears a heart shaped crystal pendant that can be removed. It's a perfect match for the bridegroom Teddy bear and measures 26 cm. The five joints mean that the head, arms and legs are moveable. 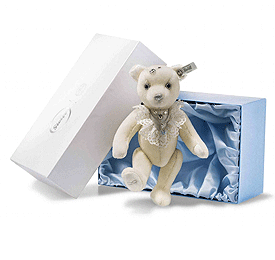 The bride Teddy bear is crafted from the finest white mohair. A silver thread runs through the nose and mouth. The three beautiful crystals from Swarovski on the right side of the head are very smart and give the appearance of a diadem. Other crystals from Swarovski are lovingly worked onto the breast. The posh necklace with the crystal heart from Swarovski can be worn as a bracelet. The bride Teddy bear has the symbol of infinity on the sole of its right foot to denote love and a life together. This elegant collector's item is supplied in the illustrated gift box.